Unlike his silver coloured counterpart a Red Labrador can be entered into official competitions. The most common colours of Lab are of course black, chocolate, and yellow (sometimes referred to as gold). However, there is a large amount of variation within the shade of yellow with many different colour coats ranging from very light to very dark. Because of this variation, there is also a type of dog known as a red Labrador retriever. The American Kennel Club considers these dogs to be a variation of the yellow labs, and when they are shown in competition, they are entered as yellow Labs. However, many breeders do try to bring out the colour variation in the yellow labs because it is so unique. 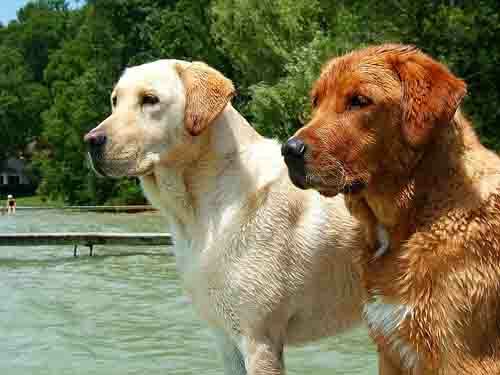 Even within the reddish variation of the yellow lab, there can be different shades of coat colour. Some are such a light colour they are mistaken for yellow labs, while others are a dark, ruddy colour that is unmistakable. The key difference is that yellow labs are a honey yellow or tan colour, while a red Lab will have a distinct reddish tint to its coat. Regardless of the shade, this type of dog can be determined by the colouring on its head and ears. The body is often lighter in colour, which accounts for some people thinking they are actually yellow. Many Labs have what is called the "chinchilla effect." This means that a hair shaft can be only one colour, or a percentage of the guard hair shows the colouring. This means that a Labrador retriever can be yellow, but thirty percent of the guard hair shows the red colouring, which makes that dog a red Lab. Another way to determine whether a dog is yellow or red is by its pigment when it is born. A yellow lab will have a pink nose, muzzle, feet, and eye rims. Those with a reddish tint, on the other hand, will have peach pigment. These Labs are born darker in colour, but lighten up as their undercoat grows in. As soon as they lighten up, the reddish colouring starts to appear in their fur as the chinchilla effect becomes apparent. There is another variation that is possible. They are more likely to develop white spots on their chests than other colours of Lab..
White is a natural variation of yellow labs, but it often blends with the yellow colouring and is not noticeable. When a lab is reddish in colour, however, it is much more likely that the white will stand out, making a white spot on the dog's chest. These spots vary in size. If you're considering bringing home one of these dogs from a breeder, remember that it is just a variation of the yellow lab. 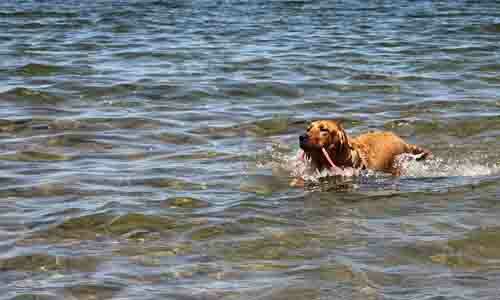 It has the same easygoing temperament as any other Labrador, and does not have any additional health risks. It is just a dog of a (slightly) different colour.